Upon entering Armstrong’s Fine Arts Auditorium, the ambient, dim lighting and palpable excitement was overwhelming. The cause for the crowd’s anticipation was the imminent Duke Ellington birthday tribute concert, presented by Armstrong and performed by Savannah’s own Jazz Orchestra April 21. As the attendees shifted restlessly in their seats awaiting the performance, one thing became clear: all in attendance recognized the greatness of the American composer, pianist and big-band leader’s talent, even after his death. The quiet appreciation for this legend was undeniable, and many of the audience members were more mature – 40 and above, past the age of the average Armstrong student. Kicking off the concert, the Orchestra performed “Take the ‘A’ Train,” composed by Billy Strayhorn, whom Ellington was known to work closely with in his heyday. As they moved on through “Ko-Ko,” arranged by Duke Ellington himself, the crowd’s overt eagerness grew. The director then announced one of the evening’s feature performers, Mitch Butler. A native of Raleigh, NC and current resident of Columbia, SC, Butler has made a name for himself as a great purveyor of jazz sound. He functioned seamlessly with the rest of the Savannah Jazz Orchestra as the lead trombonist, offering heartfelt and enthusiastic solos and melding into the Orchestra’s sound as though he had performed with them his entire career. A former member of the Grammy Award-winning New Orleans Jazz Orchestra, Butler has certainly paid his dues in the jazz circuit. On piano, Eric Jones wowed the crowd with his intricate playing. Alongside him were the memorable Randall Reese on the main saxophone and Bill Schmid on trumpet. These musicians in conjunction with Dwayne Borba on drums and Dave Elliot on trombone, as well as many other components of the orchestra, exemplified the truly organic manner in which these members of the Orchestra play together. The real treat, however, was guest singer Priscilla Albergottie. She first accompanied the group in the collaborative piece, “I’m Beginning to See the Light.” A collective chill spread throughout the auditorium as the crowd took in her sultry, velvety tones. As Albergottie performed “Solitude,” “Just Squeeze Me,” and “Come Sunday,” she soothed the audience. “I think the most important part of jazz is that it incorporates so many different emotional connections. There’s blues. There’s swing. There’s be-bop,” Benassi said. Mika Muhlenberg, a Liberal Studies junior, said she was very moved during the performance. 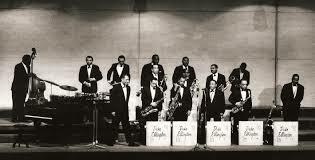 The Savannah Jazz Orchestra served Duke Ellington’s memory well. The ability of the event to inspire awe and reverence in all who attended is something many artists aim for and is something the late Ellington supremely accomplished. If the success of the composer could be quantified, it would be in the number of goosebumps and toe-taps emanated by the crowd, of which there were many.